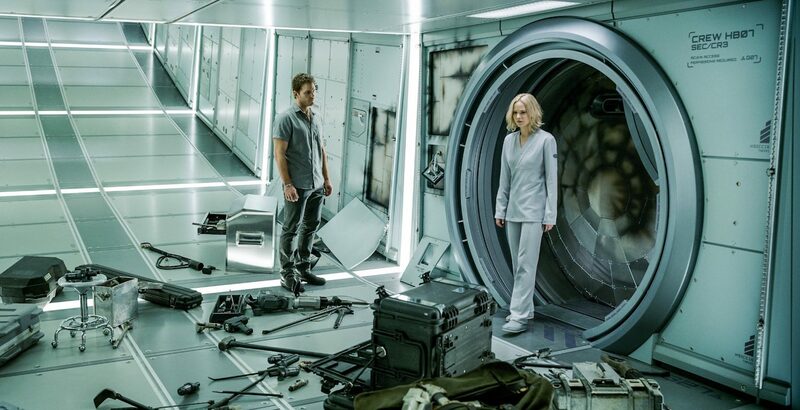 After a sleep pod malfunction awakens two passengers (Chris Pratt and Jennifer Lawrence) 90 years early, they must face a lonely future on a spacecraft traveling to a distant colony. The biggest challenge for the crew was creating a craft that was exciting and fresh to look at. 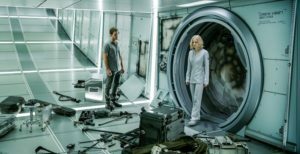 Director Morten Tyldum’s specific directive to production designer, Guy Hendrix Dyas and his art department was that if he had an environment, he wanted the actors to be in it, to feel it, so the viewer could feel their loneliness and emotions. Consequently, all the space ship interiors were built. An example of a set with a VFX extension was the grand concourse, a large shopping mall. Only two levels were built – the ground floor, and the first floor up where Lawrence jogs. The design envisioned a five-story structure with a huge glass dome ceiling. Visual effects added the three stories and dome above the “colossal” construction, which was 350 feet long. Another example of a set extension was the cafeteria, where a limited section with all the seating was constructed that VFX then extended “off into infinity.” Other interior sets were 100% built using seven stages for production. When the search for a location in Atlanta that had a pool that looked like a spa was exhausted, the art department actually had to build the swimming pool in a dirt parking lot at Pinewood studios because no stages were available. The team had already started to design a pool as a back-up, so when the producers gave a green light for the build a mere four weeks before shooting, construction of the pool was up and running in a few hours. The exterior of the ship was designed by Dyas and developed within the art department. They gave VFX a 3D model of the finished spaceship, which was then improved, tweaked and texture mapped before the sweeping shots of the craft were designed. Dyas’ overall concept for the spacecraft was to make it real, organic and based upon science. With recent films like The Martian, Interstellar, Gravity, he believes audiences are sophisticated in their expectations for science fiction movies. “One of the things I did to make the design different was to embellish it with lots of great details. The color is extremely rich. Lots of purples and reds and golds and oranges, so that you got a sense that this is a place you want to be,” shared Dyas. The purview of the art department also included creating the machine-like, Cyclops-style robots, a design that needed to be look harmless and friendly, void of humanistic features. The only other human element in the script was Arthur (Michael Sheen), the barman, because Pratt’s character needed to feel very lonely from the lack of any other humanoid or android-style robot contact.